Kurt Bresswein. Leigh Valley Live. Posted on September 10, 2016. Original article. 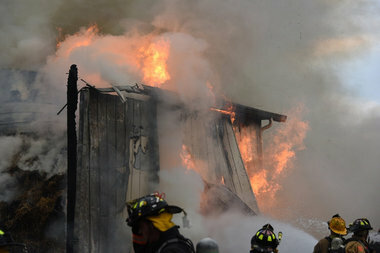 The effort to recover from Friday night’s devastating fire at Donaldson Farms was on hold Saturday. There was other work to be done. 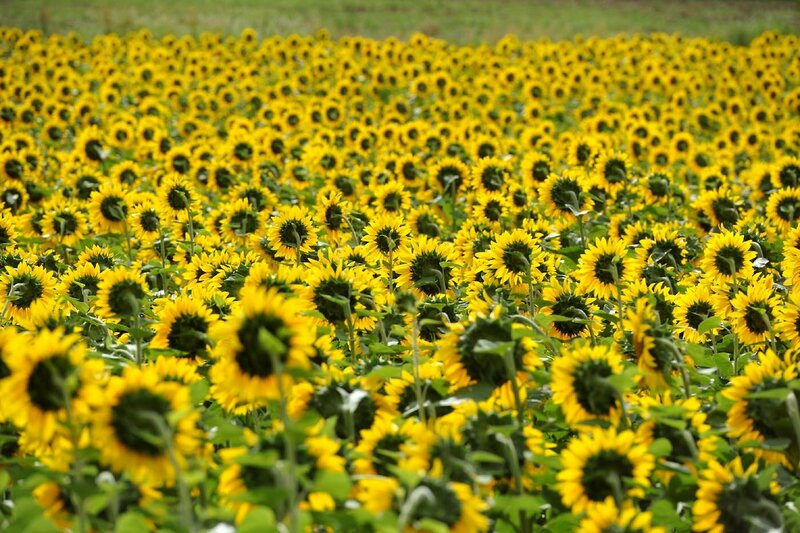 The sunflower field is in bloom, drawing visitors with cameras in hand. Saturday is market day at the 358 Allen Road farm in Mansfield Township, outside Hackettstown. This Saturday, in particular, is also the First Responders Appreciation Day in recognition of Sunday’s 15th anniversary of the Sept. 11, 2001, terrorist attacks. Greg Donaldson, proprietor, said he hoped to see Saturday some of the 100-plus responders who came to his family’s aid Friday night. Warren County fire Marshal Joe Lake said Saturday he ruled the blaze accidental. It was caused when bales of straw were ignited by sparks from a grinder being used to cut bolts off a horse trailer, he said. No one was seriously injured. Donaldson said his daughter, who was restoring the trailer, suffered minor burns to an arm during the effort to try and contain the fire and save as many of the contents as possible, including two large tractors that were moved to safety. She was treated on site with some burn cream. There were about 1,000 bales of straw in the barn, along with pallets stacked with cardboard used to form boxes for packaging up apples, lettuce and melons grown by the family and staff, Donaldson said. Small containers of propane and bagged fertilizer were also inside, typical of any agriculture storage barn, according to the fire marshal. Donaldson later clarified to say there was no propane or fertilizer inside, though the contents included acetylene tanks for welding. “Within 30 seconds, it went from a small fire, it literally went in 30 seconds to out of control,” Donaldson told lehighvalleylive.com. The loss was still coming into focus after daybreak Saturday, such as when Donaldson went looking for a shovel only to remember it had been in the barn. He anticipates learning the barn was underinsured. “There’s a reality of agriculture that probably 99 percent of the population doesn’t know about,” Donaldson said. “The only people that understand it are farmers themselves: You’re always underinsured. In addition to Mansfield Township’s four fire departments and other area agencies that responded, Donaldson said he is appreciative of his staff for their help and his neighbors who dealt with the thick black smoke as the fire raged, then smoldered, until after midnight. If there’s any silver lining, in addition to no one badly hurt, it’s that the barn that was destroyed is not essential to day-to-day trade this late summer into fall at the farm, Donaldson said. In addition to special events, regular attractions include the corn maze that opens Sept. 26. The fire marked the third barn destroyed since mid-July in Warren County, after a tornado demolished one July 14 in White Township and powerful straight-line winds took down another July 18 in Franklin Township. Mansfield’s Tri-County Fire Department was the lead in the effort, which drew 22 agencies, Chief John Casella said. “It’s unfortunate to lose any kind of property,” Casella said, “but fortunately we were able to keep it from extending to anything else.